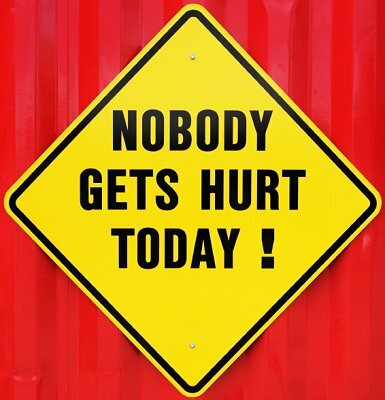 Checking out different health and safety accident pictures can illustrate just what types of accidents you may be in for if you engage in unsafe behavior, whether at home, at the office, while driving, or during any type of recreation. Fortunately, understanding the risks of your behavior can help you avoid health and safety accidents that could end you up in an ambulance. Biking can be hazardous if you are riding over unfamiliar trails or if you are not paying attention to your surroundings, even in familiar locations. To avoid an accident, always be sure your bike is in proper working order and ride defensively, watching for unexpected obstacles. Wearing the proper safety gear, including helmets and pads, can minimize the risk of injury if you do have an accident. Driving through flooded streets can be hazardous, not only by causing damage to your car, but because deep waters may hide obstacles such as potholes, sinkholes, and debris. Do not attempt to drive through deep areas, and instead seek a safer route on high ground. Winter sports such as skiing and snowboarding can lead to accidents and injuries if you try tricks and techniques you aren't practiced at. When you head out to hit the slopes, be sure you are wearing proper safety gear and appropriate winter attire, and stick to groomed slopes that are deemed safe and suitable for your skill level. If you work in a restaurant or simply prepare meals in your own kitchen, working with knives can be dangerous. Whether you are chopping vegetables or cutting meat, an injury is always just a blade-slip away. Always follow proper knife safety procedures, wrapping your hand firmly around the handle and moving the blade away from you as you cut. All chemical spills should be treated with caution, no matter what the size of the spill. Unknown chemicals or inadvertent mixtures may cause burns, toxic fumes, and skin irritation if they are not handled properly. After the spill is removed, clean the area thoroughly to decontaminate it from any residue. Pools may be a hotspot for summer fun, but they're no place for horseplay. Pushing someone into a pool or otherwise being unsafe can cause severe, even fatal, injuries. Basic swimming lessons are recommended for anyone who regularly visits a pool, and posted safety instructions should always be obeyed. Liquids and electronics don't mix, and a spill on your keyboard or other electronic equipment can be hazardous. Not only can such a spill cause sparking and shocks, but spills can severely damage delicate electronics. To avoid spills, keep all drinks away from electronics if possible, and always use sturdy cups with lids to minimize any accidents. Always use equipment safely or you could cause an accident that leads to damage or injuries. If you don't have the proper equipment available, ask for assistance to find a safe way to accomplish whatever task you need to do without risk. Being safe at the office has many meanings: protecting company secrets, obeying health and hazard restrictions, and safeguarding your job. Don't try to do too much, no matter what your job duties are, or you may find yourself in a risky situation. Even something as simple as dropping folders can be hazardous if files get rearranged and information cannot be found when needed. Despite being a commonplace activity, driving carries a great deal of risk and responsibility. Safe drivers are always defensive, watching out for obstacles and other drivers in every situation. Furthermore, be sure your vehicle is a safe one with properly functioning seat belts, air bags, anti-lock brakes, and other features to minimize harm in an accident. Ladders of all sizes can be dangerous. Whether you are working on a job site or in your own home, always be sure that any ladder you are using is sturdy before you begin climbing. Make sure that it is positioned properly, with supports locked in place. If you are climbing a tall ladder, be sure there is someone nearby to help steady the apparatus as needed. While hiking may not seem like the most dangerous activities, accidents are certainly possible. Be sure to wear proper hiking shoes, carry appropriate gear and watch your step carefully to help avoid injuries in the backcountry. Make sure that someone in your party is carrying first aid supplies just in case there is a problem. Need more tips to keep safe? Check out these Funny Safety Pictures and Stupid Safety Pictures to learn what not to do to stay safe.